Oh, come on. You haven’t heard of Sonic? You don’t know where it all began? You don’t remember first hearing those magical words from your TV? And that was the game’s “Wow” moment. From that very second, you just knew this whole experience was going to be magical. 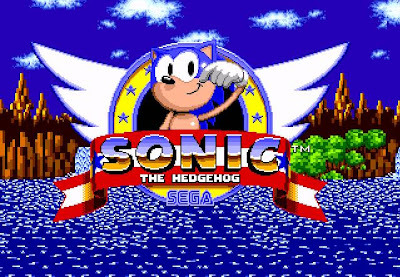 Sonic The Hedgehog was a blue, spiky critter with a penchant for spins and speed. His primary weapons were his spines, which, like all hedgehogs, he was able to use for protection by curling into a ball. He could roll, he could somersault, he could run, and he could jump. 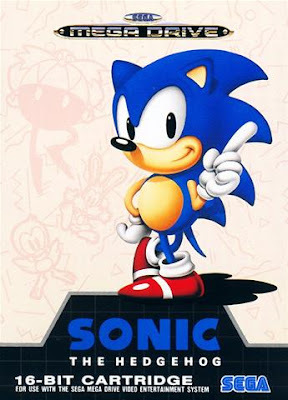 Instantly recognisable, even now, Sonic has been Sega’s mascot for a considerable length of time. Conceived as Sega’s equivalent of Mario, he has featured in some of the greatest (and fastest) games of all time. But where it all began (at least for me) was the Megadrive version. This game boasted superb graphics, extreme speed and an amazing sound track. Borrowing aspects from the best platform games of the era, Sonic moved away from the traditional sedate-by-comparison run and bump of Mario, and into the hell-for-leather spinning and running frenzy that we all came to love. The storyline isn’t really important, but there is one anyway… Dr Robotnik (later renamed Eggman for some reason) has kidnapped a load of your cute buddies and imprisoned them inside robots and metal containers, you’ve got to free them all. This is done by completing levels which are filled with collectable rings rather than the coins found in other games. Every 3 stages yields a meeting with Robotnik, who will attack you in interesting ways. Defeat him and he’ll run away whilst you bust open a metal container filled with bunnies and stuff, signalling the end of your time in that particular area. 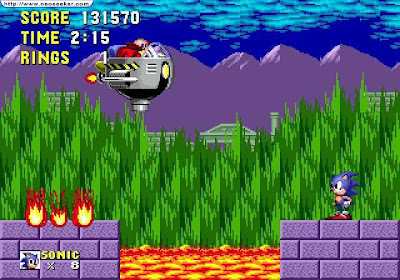 Defeat Robotnik in the “Final Zone”, and that’s the end of the game, you have saved all your friends! You’d think Sonic could go and put his feet up and relax with a cup of cocoa or something, but that may not be the case… did you collect all the Chaos Emeralds? 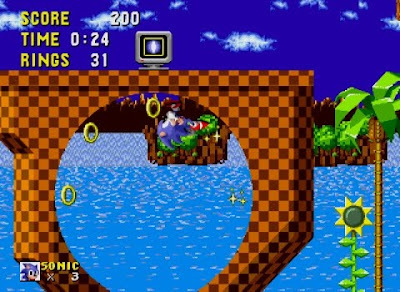 Ah, you see, whilst you were zipping through the levels like a deranged hamster, you didn’t collect enough rings to open up the bonus stage at the end of each level. 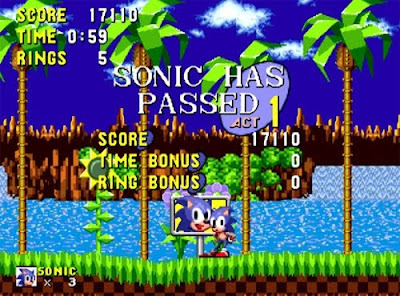 Either that or you didn’t see the big ring at the end of the level which transports you to said bonus stage… Here you can earn a “Continue” (Or 3 extra lives if you prefer to think of it that way) as well as the aforementioned Chaos Emeralds. These are the key to the true ending of the game, you need to find all 6, and they are all contained in the bonus stages, which are spinning mazes with funky parallax scrolling in the background (remember when that was a major selling feature of a game??). I’ve just noticed a major error in my writings today… I refer to the game as having “levels” or “stages”. Of course, this was the start of a brave new world where Sega used different names to “stand out” from the crowd. The game was divided into “zones”, each of which were each divided into 3 “acts”. Each zone had their own particular characteristics, for example the Green Hill Zone had lots of Green Hills (and many fast sections), the Marble Zone was a tad slower and more delicate with lots of lava, the Spring Yard Zone was back up to speed with enormous half-pipes, the Labyrinth Zone introduced pyramid-like caverns and water, the Star Light Zone had big open spaces and huge jumps (and instant-death falls), and the Scrap Brain Zone had lots of booby traps to contend with. Along the way were your standard power ups and bonuses hidden in TV screens around the levels. There was the usual extra rings, extra lives and invincibility, but also speed boots and a one-hit protection shield. One other departure from the standard platform recipe was that your collected rings could be lost when you took a hit. Upon being hit, your rings would spill out, or, if you didn’t possess any rings, you’d die and lose a life. This meant that if you just had the one ring, you would be in a mad dash to try and retrieve it before you took the fatal blow. This did push the game a little towards the easy side, at least in terms of staying alive. Attaining the highest scores, though, would require some considerable skill. Although this game spawned multiple sequels and conversions, this version is the one most fondly remembered and has won a place in gaming history, and is certainly a game you should make an effort to play, as well as the slightly more difficult Master System version. Just one last thing, the Megadrive version featured one of the most unusual extras, as if part of the developer’s level design tools were left in the game. If I remember correctly you need to input the level select code first (up, down, left, right at the title screen), followed by up, C, down, C, left, C, Right, C and then hold A and press Start. When you then start a level you should keep A held down, and the score display will look slightly odd. You can then select various level objects and place them on screen. An interesting feature, and a reminder that most cheat modes were not originally meant to be “cheats”, but tools for a developer to reach parts of a game easily to test them!